There has been a lot of discussion about innovation and how to get it into design and into actual products. Serious innovation is not something that is dropped into the mix – rather, it is built up at all stages of design and production. For the design part, it requires a culture within which it can flourish and grow, even one that can permit unusual and improbable ideas to have a chance at life. For most of the last 25 years there has been a great deal of emphasis on out-sourcing, and loading suppliers and subcontractors with the complexities of their specialized products; the main manufacturer is more of an assembler than a maker. Recent changes in software and controls have revised much of this thinking: there is now greater reliance on producing “just in time” so as to reduce costs of inventory and storing supplies; so too, small orders are more feasible, and with greater inventory and production control a large number of variations, previously thought impossible to manage, can be provided. One other aspect is changing as well, with a recurring interest in centralized control of design and manufacturing. This has been promoted by firms such as Apple and other vertically integrated companies. This is not a wholesale return to the days of old, where production was completely centralized under one roof; although conceptually attractive, the reality is that a return to River Rouge is unlikely. A successful strategy today is likely a combination of all techniques (outsourcing, just in time, inventory control and variations, and centralized information). As we increase our understanding of all the particulars of this puzzle, it is worth looking into one aspect of this puzzle, that of centralized control of production. Many of us are familiar with Ford-ism, also known as Taylorism, after Charles Taylor who invented this technique of scientifically measuring efficiency in work tasks and production. It was the lifeblood of Henry Ford and his company, but it is still predominantly an American model. Other examples also exist and can provide insight into control and excellence in manufacturing. Lancia was one such example, and represents a particular approach possible in a medium-sized manufacturing company mastering the industrial process. In the height of Lancia’s success with the Lambda in the 1920s, their manufacturing processes caught the attention of the international press. In 1928-29, J.A. 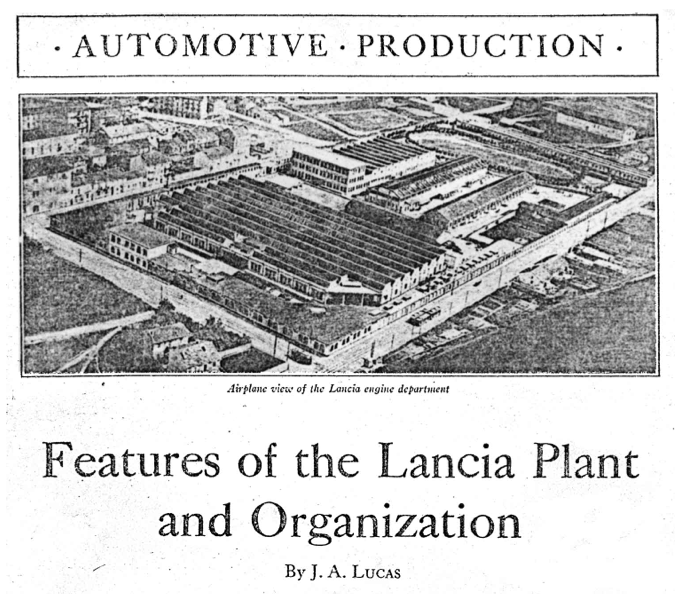 Lucas wrote a series of articles for the American Machinist detailing Lancia’s work processes; these have been assembled and reprinted at “Lancia Machining” on www.lanciainfo.com. Here is one of the first articles, on the Lancia plant itself and how it was organized. Its rather in-depth and for those who have managed production, points out a number of ways in which quality and innovation were protected early on at Lancia in the midst of large scale production. The first of his articles in 1928 is provided here for reading.